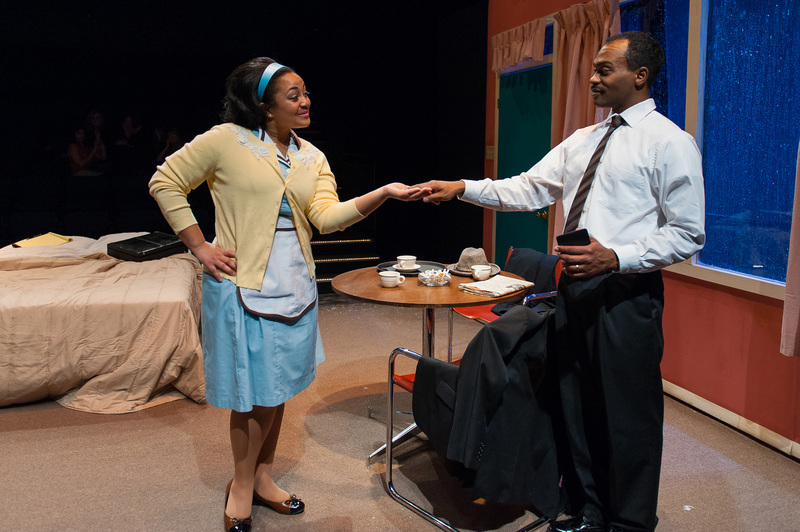 Kami Rushell Smith and Maurice Emmanuel Parent in Underground Railway Theatre’s “The Mountaintop.” Photo: A.R. Sinclair Photography. CAMBRIDGE — What really happened in the hours before the Rev. Dr. Martin Luther King was shot to death outside his motel room in Memphis? Playwright Katori Hall has plucked from her imagination her own version of events, and she presents it in “The Mountaintop,” an Underground Railway Theatre production now at the Central Square Theater. All we have to do is see the Lorraine Motel sign on Susan Zeeman Rogers’ engaging set and we know where we are — Memphis, Tennessee. Soon we find it is April 3, 1968, and we are in Room 306 when King (Maurice Emmanuel Parent) enters. He has just delivered his speech “I’ve Been to the Mountaintop” at the Mason Temple to the striking sanitation workers, and is muttering as he talks about “Why America is going to hell.” He sighs as he unscrews the receiver of his phone to check for bugs before making a call to the office of the motel asking for room service to deliver a cup of coffee. A storm is raging outside, thunder and lighting, fire and brimstone, much like the fire and brimstone that are part and parcel of a preacher’s sermons. His friend Ralph Abernathy is off searching for a pack of cigarettes, and King is coughing and discouraged, nervous and agitated by the phone calls and threats that are an almost constant presence in his life. A knock comes, and the coffee is delivered by a maid named Camae (Kami Rushell Smith). Portraying an icon is tricky business, especially a beloved icon such as Martin Luther King. Playwright Hall and as King do a nice job portraying King the man, with the accompanying fault lines that make him human and accessible. He smokes too much; the endless marches have worn holes in his socks and left him with smelly feet. He lies to Corita during a phone call about having tea instead of coffee. King is not above taking a nip or two from Camae’s flask and a cigarette or two when offered. As Camae, Smith is earthy, flirtatious and profane. She defers to Dr. King at the beginning but is soon feeling her oats, offering him advice on how he might draw more people to his rallies and on dealing with women. “If I were you, I’d be looking at me, too,” she says as she smiles coquettishly at King. Amid the obvious chemistry and budding relationship, there is also silliness that threatens to derail it — a pillow fight scene that seems hopelessly misplaced. Parent gives us a glimpse of the oratorical skills that King possessed and Parent skillfully replicates. At some point the plot will takes an ethereal turn, and it is up to the theatergoer to decide how they feel about it, since theater officials have asked reviewers not to reveal it. An aside: part of the pleasure of being around the Boston theater scene for years is the pleasure of watching actors and actresses such as Parent and Smith grow before your eyes, gaining the experience and confidence to sparkle in a role where a few years before they might not have been equal to the task. URT‘s “The Mountaintop” is an engaging and thoughtful piece, not without its flaws — mostly a cause of overreaching by playwright Hall — but it is well-acted by both principals and skillfully directed by Megan Sandberg-Zakian. Directed by Megan Sandberg-Zakian. Through Feb. 3 at the Central Square Theater, 450 Massachusetts Avenue, Cambridge. Tickets $15 -$50. http://www.centralsquaretheater.org.